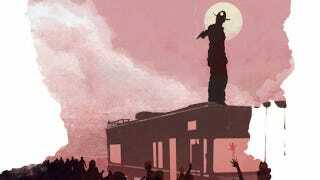 Michael Rogers' trio of posters for The Walking Dead puts zombies front and center, while highlighting the key visual elements from each season. He captures the all-encompassing death of the show's post-apocalyptic setting by always turning the moon into a zombie's looming eye. Rogers sells these posters at his Etsy shop, BigBadRobot, along with other silhouette posters. He also has a Daryl Dixon poster, complete with crossbow and chopper, but it's not quite as visually striking as these season-by-season posters.